The aim of ALT GIST is to determine whether an alternating treatment approach – using Imatinib and Regorafenib – improves disease control in patients with advanced (metastatic) gastrointestinal stromal tumours. Gastro-intestinal stromal tumours (GIST) are rare cancers that can develop in different locations throughout the gastro-intestinal tract. However, there are cases when the tumours have spread to other parts of the body or cannot be removed by surgery. The aim of this study is to determine whether an alternating treatment approach – using Imatinib and Regorafenib – improves disease control in patients with advanced (metastatic) gastrointestinal stromal tumours (GIST), compared to standard treatment with imatinib alone. If the alternating treatment is found to have a benefit and be tolerable to participants, this would lead to further studies in a larger, Phase III trial. 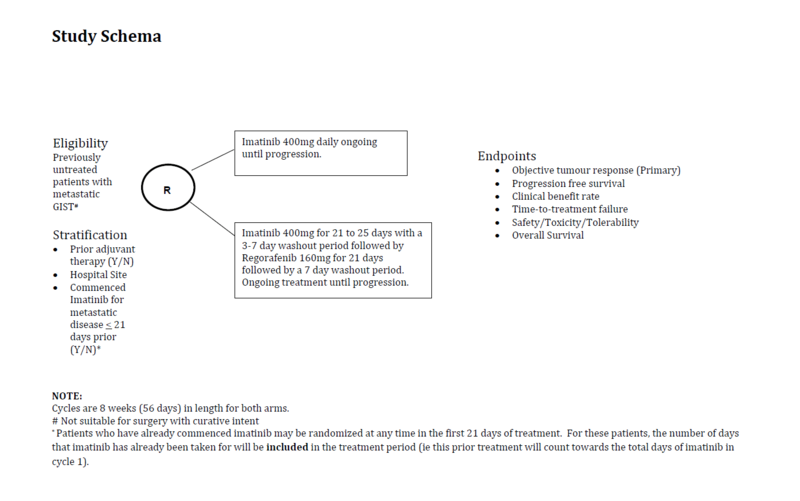 The aim of this study is to determine whether an alternating treatment approach – using Imatinib and Regorafenib – improves disease control in patients with advanced (metastatic) gastrointestinal stromal tumours (GIST), compared to standard treatment with imatinib alone. If the alternating treatment is found to have a benefit and be tolerable to participants, this would lead to further studies in a larger, Phase III trial. Gastro-intestinal stromal tumours (GIST) are rare cancers that can develop in different locations throughout the gastro-intestinal tract. However, there are cases when the tumours have spread to other parts of the body or cannot be removed by surgery. Imatinib is a medication that is used to treat GIST, which cannot be removed by surgery. Imatinib is taken in tablet form and works by blocking a chemical involved in cancer growth, which may slow down the growth of a tumour. However, although there is initial improvement in patients treated with Imatinib, in almost all cases the cancer will develop resistance to the drug. ALT GIST is a Phase II randomised multi-centre trial to investigate a new treatment approach to improve cancer control in patients with advanced GIST. It is believed that GIST cancer cells may become resistant to Imatinib because constant exposure to the drug creates changes in the cell that stop them from being affected by the medication. In ALT GIST, the treatment plan is to alternate Imatinib with a second cancer drug called Regorafenib. It works in a similar way to Imatinib and has been shown to be effective against the progression of GIST after other treatments have stopped working. The aim of ALT GIST is to improve patient survival rates by stopping the cancer cells from becoming resistant to Imatinib. The aim of this study is to determine whether an alternating regimen of Imatinib and Regorafenib improves disease control in patients with metastatic GIST. The primary objective for the study is progression free survival at 24 months. Secondary objectives include objective tumour response rate, clinical benefit rate, complete response rate, time-to-treatment failure, safety/toxicity/tolerability and overall survival. ALT GIST is a randomised Phase II designed to determine whether an alternating Imatinib and Regorafenib treatment plan will be effective in stopping drug resistance in patients with advanced GIST. Currently, the standard first line treatment for unresectable GIST is continuous treatment with Imatinib. However, in almost all cases the cancer will develop resistance to the drug. One possible cellular mechanism behind this resistance is that after continual exposure to the drug, GIST cells develop changes in their growth pathways that allow them to eventually become unaffected by the medication. The purpose of ALT GIST is to alternate Imatinib with a second drug called Regorafenib, which has been found to display efficacy in delaying the progression of cancer. Using an alternating regimen of Imatinib and Regorafenib, with brief drug-free intervals, may allow tumour stem cells to re-enter the cell cycle and become susceptible once more to drug therapy. Regorafenib, a multi-targeted tyrosine kinase inhibitor (TKI) with activity against angiogenic, stromal and oncogenic receptor tyrosine kinases, has demonstrated activity in the treatment of GIST and is FDA approved for third line therapy of advanced GIST. If the alternating treatment is found to be beneficial and tolerable, it would be further studied in a Phase III trial. ALT GIST is a randomised Phase II trial designed to investigate effectiveness and activity by alternating the medications: Imatinib and Regorafenib. Participants will be randomly allocated to one of two groups. Participants will either be treated continuously with Imatinib (control group) or receive alternating treatment with Imatinib and Regorafenib. For a single cycle of study treatment in the experimental arm, an Imatinib (400mg) tablet will be taken orally for 21 to 25 days followed by a 3 to 7-day gap when there will be no medication. In total, the days taking Imatinib plus the period without medication must be 28 days. This is followed by 21 days of Regorafenib (40mg), which will be taken as 4 tablets daily, and a 7-day gap without medication. The control group will be given a regimen of continuous Imatinib in a 56-day cycle. For both groups treatment will continue until progressive disease or unacceptable toxicity. A drug administration diary will be provided to all participants to record their intake and progress. For the first 12 months, CT scans every 8 weeks will evaluate the effectiveness of the treatment. After the initial 12 months of the trial, the CT scans will be performed every 12 weeks and continue until there is cancer progression. Participants will be regularly monitored for a minimum of 24 months follow-up in order to determine whether the alternating treatment approach improves disease control. If it is found to have benefit and be tolerable, this alternating approach will be further evaluated in a larger study.